The budget deficit for fiscal year 2018 hit $US779 billion, according to the Treasury Department. The deficit increased by 17% compared to 2017 and is the largest deficit since 2012. 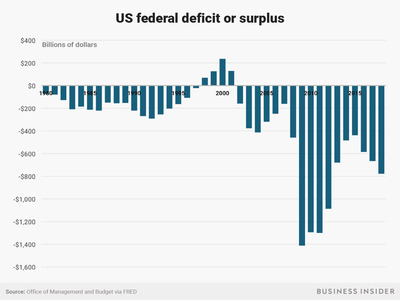 The GOP tax bill and massive budget agreement helped to grow the deficit. The increase in the deficit will only accelerate in years to come, the Congressional Budget Office warns. 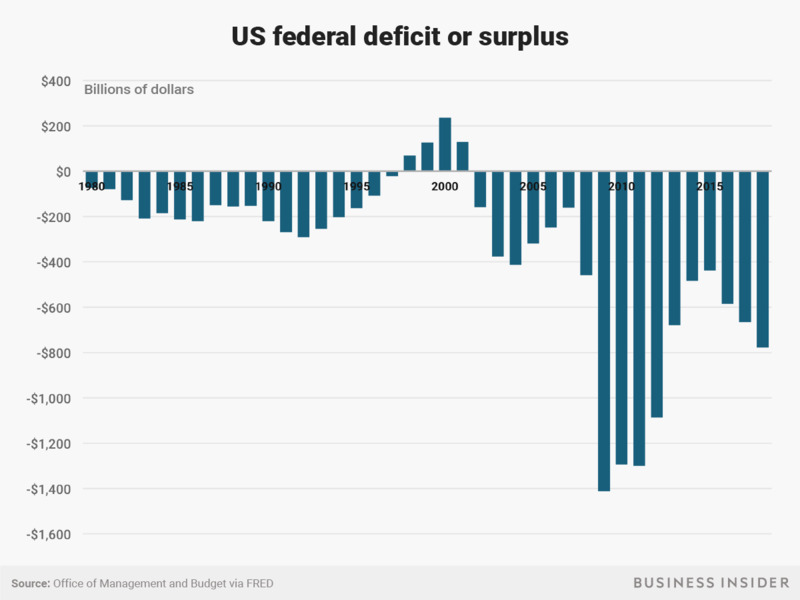 The US federal budget deficit jumped to $US779 billion in fiscal year 2018, the highest level since 2012, according to the Treasury Department. As the GOP tax bill and massive spending agreement took hold, the deficit for fiscal year 2018, which ran from October 2017 through September 2018, was 17% wider than 2017’s and totaled 3.9% of GDP. According to the Treasury, revenue grew by just 0.4% as spending grew by 3.2%. In a possible prelude of what’s to come, corporate tax revenue dropped 31% in fiscal year 2018 while personal income tax revenues ticked up 6.1%. While corporations pay taxes on a quarterly basis, meaning businesses filed under the GOP tax law for three-quarters of the year, most American households won’t file taxes under the new system until April 2019. The increase is the wrong direction if the president wants to eliminate all of the US’s debt in eight years, as Trump promised he would do on the campaign trail. Kevin Hassett, the chairman of the White House’s Council of Economic Advisers (CEA), recently promised Trump would release a plan to get the deficit under control. Hassett said the plan would focus on spending cuts, possibly including cuts to entitlement programs such as Social Security and Medicare. According to official projections, the deficit is only going to grow form here on out. The Congressional Budget Office estimated that the budget deficit for 2019 will be just a hair under $US1 trillion and will eclipse $US1 trillion in 2020, the first deficit of that size since the depths of the financial crisis. Much of the increase is pegged to recent legislation, according to the Committee for a Responsible Federal Budget. A recent CRFB report found that legislation passed in the 2018 fiscal year will account for $US445 billion worth of fiscal year 2019’s $US973 billion budget deficit, or 46% of the total. In total, legislation enacted in the 2018 fiscal year will add $US2.4 trillion in new debt by 2027. Maya MacGuineas, CRFB’s president, said the new release was an important wake up call for Congress. The White House didn’t immediately respond to Business Insider’s request for comment.